You are here: Home / Family Living / Multiplication Math Tricks! My first thought this morning was to wow you guys with some homemade something or other but my daughter felt the need to toss out an idea. She thought it would be peachy keen (yeah they don’t say that anymore) to show you guys a few math tricks that will either make your kids learn their multiplication tables or find a different way to do them. My husband says one of the techniques is maddening and would force a child to memorize their multiplication tables. My kids enjoyed playing with these math tricks so I figured on a snow day, this might entertain your children as well. This trick does not have a name that I know of but it is a lot fun. It really helped my daughter with her confidence when she was learning her 9 multiplication tables. This particular trick teaches your little one their 9 multiplication tables. Simply write TEN lines on a sheet of paper and choose your math problem. For this problem, I chose 9 x 7= . Simply count left to right and scratch away the 7th line. To the left of the 7th line (the line with the squiggle), you will find that there are 6 lines and to the right there are 3. The answer to 9 multiplied by 7 is 63! This trick is great to empower the children when they fear learning their 9 times tables. This works well for 9 multiplied by any number between and including 1 and 10. Here is another great example. 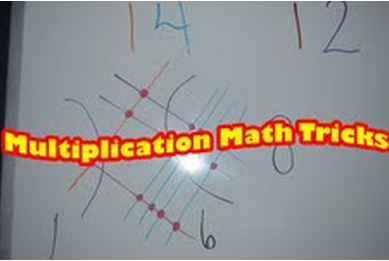 Our next fun tip is a trick to learning your 7 multiplication tables. This one is odd and simple. Begin by drawing yourself a tic tac toe chart. Now comes the fun part! Starting by placing the number 0 in front of the number 7 and continue with 1 and on to number 2. Since 2 was the last number you used, begin the row with the number 2. Continue on until you reach number 4. Begin the last row with the number 4 and finish the Tic Tac Math-O! This trick can continue on and on but I just wanted to give you a quick example. Last but not least, multiplication made easy. I say easy but my husband says it will make a kid want to learn the “proper” way to multiply. That just means the way he finds the highest level of comfort. Our math problem for this exercise is 14 x 12 =. For this exercise, I decided to color code the numbers. For the number 14, I drew 1 line to represent the 1 in 14 and 4 lines to represent the 4 in 14. Notice that these lines are slanted. This is important as we will draw different lines to represent the other half of our math problem. In brown, I have drawn a line crossing all of the existing lines. This line represents the number 1 in 12. Now I will draw 2 more lines to represent the 2 in 12. Now that we have all the lines drawn, it is time to mark the intersections. Have your little student to draw a dot or circle over each intersection. This problem is very interesting because you have to look at where the lines cross initially. On the left, it is clear there is one intersecting side. Draw a line that separates that one dot from the rest of the dots. Look to the right and draw a line separating the next section of dots. This may not seem as clear the first time you do the problem. It gets easier as you go. Now it is time to count the intersections. Start from left to right and count the numbers in each section. Now you see why the husband thinks this will force your kids to learn the traditional way to do multiplication. Once you get the hang of this, it’s very simple. Check out this next example and see if it starts to become clearer. The first few steps are pretty simple. The toughest part is knowing where to separate the intersections. I think this problem shows the easiest way to perform this task. Notice the intersection above with the arrow. Base your separation on the piece that intersects furthest to the right or left. Notice how the line does not cross the second set of intersecting lines. This is the key to knowing where to separate. Now just count your intersections and you will have your answer. Now you have a few starter tricks to share with your children. This is just multiplication, imagine what else we do when we get bored!